fantastic print marq, all in for this one. Favorite! Very nice work Marq! is this where you enter the lotto? 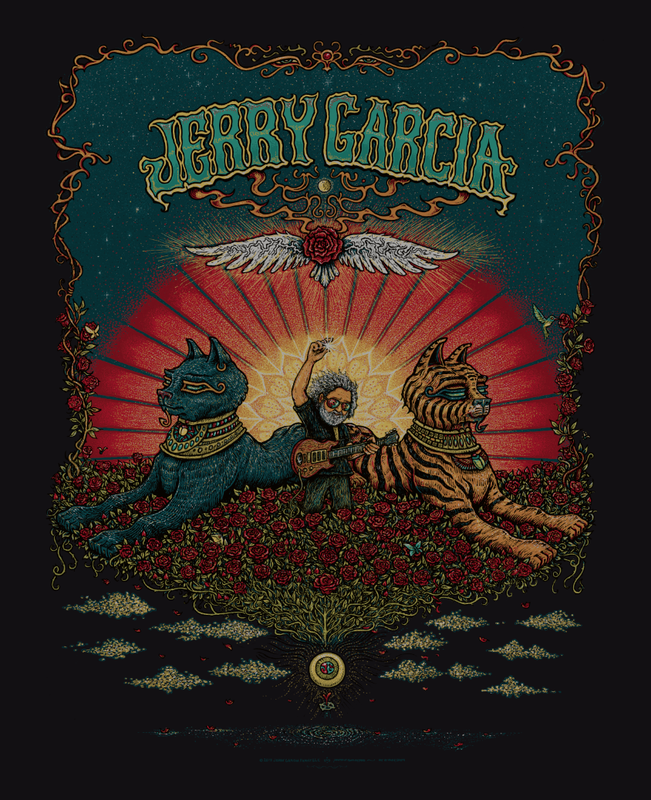 Get yours tomorrow (4/20) at JerryGarcia.com! Screen Printed limited edition run of 420 posters signed and numbered by artist Marq Spusta. 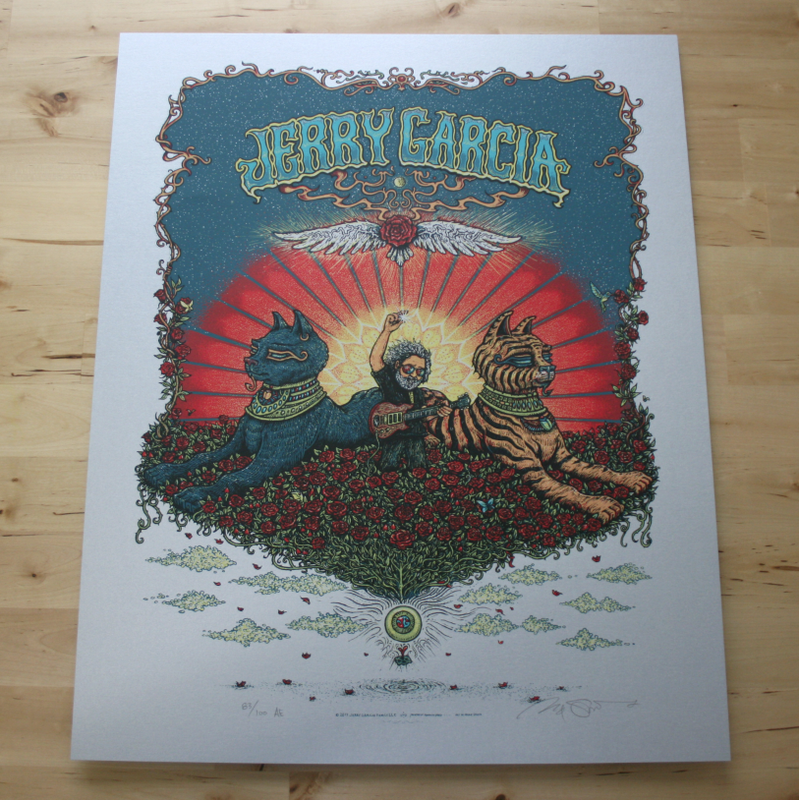 Screen printed poster measures 17″ x 21″. THIS POSTER WILL BE AVAILABLE FOR PURCHASE BEGINNING APRIL 20TH AT NOON EST/10AM PST FOR $35.00. ANY REMAINING POSTERS AFTER APRIL 21ST AT NOON EST/10AM PST WILL BE SOLD FOR $50 UNTIL THE EDITION IS SOLD OUT. Please note: This item is available for pre-order. Orders are expected to ship on or around the week of April 26, 2013. All items in your order will be held for shipment with the pre-order item, so please place a separate order if you would like non-pre-order items earlier. it’s perfect Marq. I love this print. Isn’t noon EST 9 am PST? I’m confused, but will go at noon, then again at 1 I suppose. Nevermind. Scratch that comment. They appeared in the shop 10 min later than advertised. Giggidy. Is anyone getting through with purchases? I’ve been trying for 22 minutes now. Nope, nothing but sorry technical issues messages at end of checkout repeatedly. The good news is they had no issue signing me up for the mailing list 16 times. Nice software. Crossing fingers for an AE, or Variants. I must have this poster. There is no other person that can bring a tear to my eye from the music they play. Amazing poster Marq! Can’t wait to see this one in person!! I had no issues w/ getting one even on my phone too. (I was a lil worried my phone would be too slow) =D happy day!! I was wondering what paper that is, just a plain black? Black paper with hints of sparkle. hope to score an ae ! what do they look like little gnome? Went on line at noon but I guess I was .00000000000003 seconds too late!! i am really looking forward to a chance at the AE release since music today did a wonderful job of keeping this out of my hands. Can we get a pick or two of what to expect? I just talked to Music Today about my order, which still says “processing”, and it doesn’t sound promising for a bunch of us who purchased and paid for one of these during the very small window when they were for sale. Did they oversell? Any ideas on what happened? Saw a Gold Edition of this print, what’s the word on that? Any update on the AE? -Thanks! HAS ANYONE RECEIVED THE POSTER YET? , I emailed music today and still no response. I need my Jerry! There are a whole lot of ’em being sold on eBay. I just want the One that I ordered at 12:22 pm on 4/20. I am also having trouble getting response from Musictoday after three attempts. Be patient? Musictoday just offered to sell me one and refund me for the others I have already paid for because they accidentally shipped them to the wrong people. They are offering me a free handbill as compensation. How many handbills are being printed? Will you be posting a picture of the handbill before I decide to accept the offer? MT telling me same thing. Total BS and a complete mess. Confirmed orders are just that and are legally binding. Those of us who ordered Saturday and have valid purchase orders are legal entitled to what we ordered plain and simple. They have know for weeks and been passing the buck coming up with this “resolution”. the handbill makes good on this disaster. I was home refreshing and waiting at 11:55 est, it is sad that people who ordered Monday received prints when those who took time on a Saturday afternoon did not. Yeah looking forward to what the handbill looks like. The print is fantastic as is the Black Keys from the 10th. Really like the Egyptian vi be with Marq’s always good symmetry on both. i also got screwed out of my 4 posters, 2 of which were gifts one for my dad who brought me to my first dead show in 78 and has seen them over 600 times, i was online right when they went on sale on 4/20 but yet the people who ordered on 4/22 got theirs, pretty messed up,about the worst poster debacle i’ve ever seen in my years of collecting posters. hope there’s a chance at a variant here in the future. Anyone else receive their Jerry mini today? Thanks Marq, that is great! Why are the minis a limited edition of 100? I’m curious and wonder if that many people ordered multiple prints. I only purchased one and feel damn lucky if that is the case.. Anyone have the story. I’m just curious where the edition of 100 came from. Did you get that email from Charles Dart explaining the mix-up and how orders were taken after the edition sold out? It caused a delay of the last 100 prints I think and those of us who had to wait for things to settle down at Musictoday got the handbill as a sort of apology. 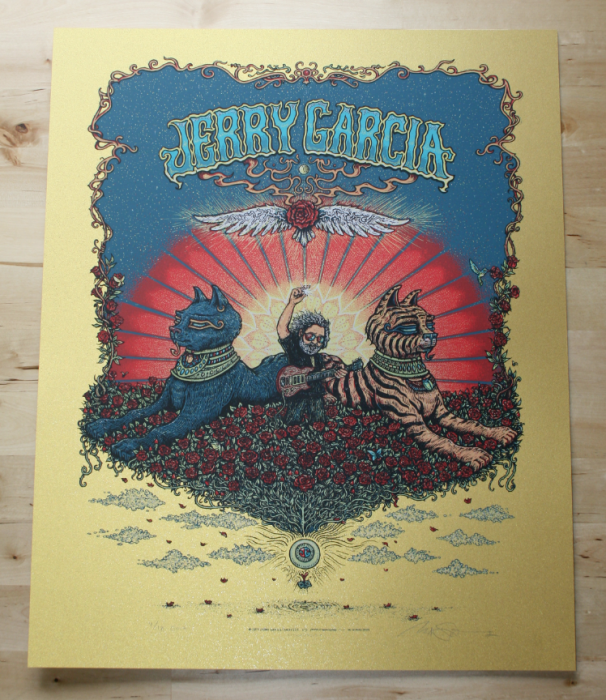 We wanted to update you on the issues here at Musictoday related to your order of the Jerry Garcia “Bed of Roses” poster by Marq Spusta. The “Bed of Roses” poster officially sold out as of 1:00 pm EST on April 20th. Due to an inventory management error, an additional quantity of posters was inadvertently offered for sale on April 22nd. While all orders from the 22nd of April were refunded, the shipments remained in our system and many were delivered to customers who were not entitled to receive a poster. The result was a significant delay in the shipment of your order. We are very happy to report we have resolved the issue to be best of our means and have located a poster from the edition of 420 to fill your order. Your order containing one poster will be shipping no later than Friday this week. In addition to the “Bed of Roses” Poster, you will also receive an additional gift of an exclusive handbill derived from the “Bed of Roses art designed by Marq Spusta as a thank you for your patience. This handbill is currently in production and will ship as soon as it’s available. We will provide an image and additional details to you when it’s ready to ship. We again apologize for this error on our part and for thank you for your patience while we came up with a solution. Please feel free to reply to this email if you have any questions or concerns. Ahhh. I see. So it is those of us that ordered on 4/20. I am 419/420. That was close. missed the onsale through jerrygarcia.com I hope to score one on the AP drop, I am on vacation though, does anyone know if Marq Tweets when the drop happens? I really want to get his.